Gina Rinehart is undoubtedly one of Australia’s leading business people with an unmatched story of success and commitment to advancing Australia. From Red Tape to Red Carpet …. And Then Some is Gina’s second book. The title is drawn from a mantra made famous by India’s Prime Minister Narendra Modi and his drive to cut regulation in his country to increase economic growth and raise living standards. Such red tape cutting has seen india double its economic growth in less than a year, and become the leading country in the world for its economic growth rate. It is a philosophy that Gina Rinehart can see applied to help Australia cut costs, raise living standards and enable Australia to be more internationally competitive. 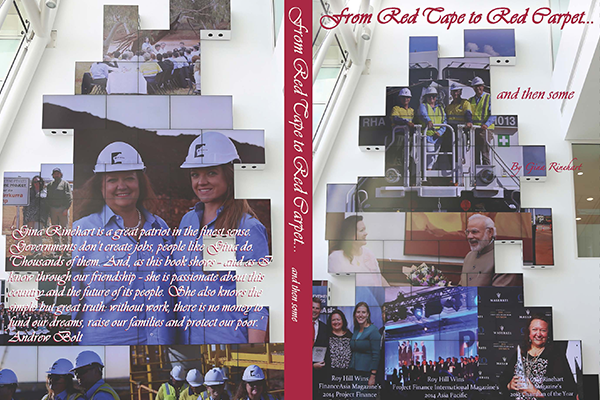 This book received the enormous honour of being personally launched in India by Prime Minister Modi, who described it as “courageous” and “Gina, a crusader for the cause of increasing productivity and making her country greater”. Former Governor General of Australia, Michael Jeffery, describes the book as “a recipe for the economic and moral change Australia needs to ensure lasting opportunities and prosperity for future generations”. “required reading for anyone in government in Australia and a powerful message from someone who has seen the real impact of over-regulation”. “No one understands the importance of Asia to Australia’s future better than Gina Rinehart. She has long advocated a vision of our role in the region that goes well beyond natural resources”.